Ever wondered where the expression “French Farce” got its start? Surely one would be the works of Beaumarchais, celebrating the fictional barber from Seville and French nobleman’s retainer, Figaro. Known to modern audience s more as the subject of comic operas by Mozart and by Rossini, the original plays were classic farce. Now, at A Noise Within, Charles Morey’s admittedly loose adaptation of Beaumarchais’ “Figaro” seems destined to be a solid hit. It’s just that funny. The tale is familiar, but the rendition proves delightfully surprising anyway. Figaro, the valet to the Count, is about to marry Suzanne, the maid to the Countess and his true love. Suzanne clues him to the fact the Count’s gift of a bed and a room of their own, situated between that of the Count and the Countess, is a matter of convenience but not for Figaro and his bride. The Count is determined to have Figaro’s bride as well – and Figaro is furious. Suzanne points out that the Countess is still in love, even if her husband is not, and a plot begins to form. Meanwhile the older housekeeper, Marceline, lusts after Figaro, family physician Dr. Bartholo loathes him, and gardener Antonio’s daughter, Fanchette, falls for the silly romantic boy Cherubin. If this sounds like a collection of circular stories, you’re right. But just wait. In the hands of director Michael Michetti, the enterprise becomes a delightful romp. Though Jeanine A. Ringer’s multi-doored set has some functional issues, there is still the appropriately silly manner of comings and goings, hidden listeners and mistaken agendas. Switched identities lead to laughter, and the net result is suitable and usually happy endings. Still, it is the romp one remembers. 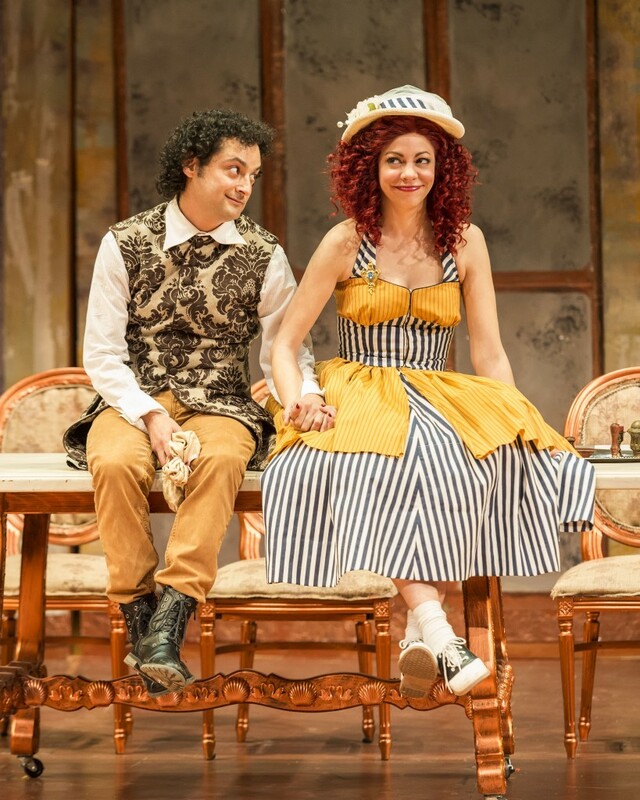 Much of the pacing and an equal percentage of the hilarity comes thanks to Jeremy Guskin’s Figaro. His arch approach to the character, his sly asides to the audience, and his sheer comedic physicality all work together to set the tone and the pace for the rest of the production. Indeed, this wry Figaro proves almost contemporary in his humor, perhaps because adaptor Morey readily admits “freely adapting” the older tale to meet tastes of a modern sensibility, and possibly because Guskin is just that funny. Angela Sauer’s Suzanne provides a most suitable foil for this Figaro – strong, sardonic, and wise. Andrew Ross Wynn makes the Count a pompous grotesque, which aides the comedy, and Elyse Mirto’s sexually frustrated Countess makes a manipulatable foil for Suzanne. Jeanne Sakata vibrates with frustrated passion as Marceline, while Alan Blumenfeld makes a stuffy and distanced Dr. Bartholo. Will Bradley has a ball as the overly romantic Cherubin, while Natalie De Luna makes a seriously innocent Fanchette. Still, it seems the one performer having the most fun has to be Joshua Wolf Coleman, who becomes the simple Antonio, the pompous music master Bazile, and a toadying, speech-impaired judge, by turns. The pacing, thanks to Michetti, stays lively, the jokes fresh, and the humor impressively current. Let’s face it – some things are just universally funny, and this production, given this sense of physical comedy combined with a classic, farcical set of situations, fits the bill to perfection. “Figaro” is only one of three shows which will play in repertory through this spring at ANW. It follows the spare “Threepenny Opera,” opened recently, and will be joined at the end of the month by a new version of Shakespeare’s “Julius Caesar.” Meaning this is the one to come and laugh at, and with. So do it. You’ll feel better by the end.